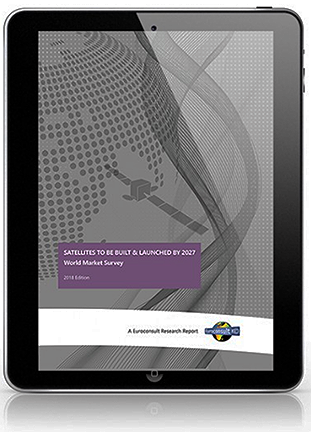 According to the 21st edition of the company's Satellites to be Built & Launched over the Next 10 Years report, Euroconsult anticipates that 330 satellites with a mass over 50 kg. will be launched on average each year by 2027 for government agencies and commercial organizations worldwide — this is a threefold increase over the past decade as the satellite market experiences a paradigm shift with the rise of small satellites and large constellations. The 3,300 satellites over 50 kg. 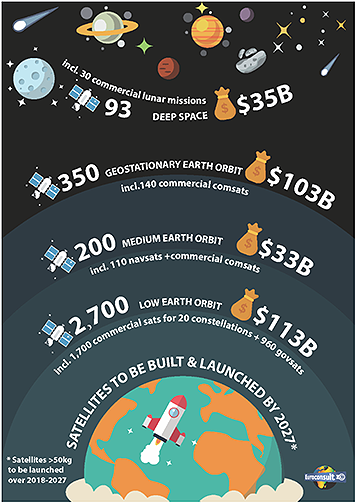 to be launched over 2018-2027 should represent a market of $284 billion for the space industry in terms of building and launching, up 25 percent over that of the past decade. At the same time, a price decrease is visible in the satellite industry, driven by the commercial constellations of smallsats introducing new production and operation concepts including economies of scale, softwarization and vertical integration up to data analytics. Governments will remain the largest customer of the satellite and launch industries, with 1,300+ satellites to be launched over the next 10 years for about 70 countries, for a market value of over $200 billion. Governments dominate the space industry as established space countries replace and expand their in-orbit satellite systems, and more countries acquire their first operational satellite systems, usually for communications, Earth observation and imagery intelligence. Eighty-five percent of the government market will remain concentrated in the 10 countries with an established space industry (the U.S., Russia, China, Japan, India and the top five European countries). The other 60 countries invest in satellite systems to develop domestic space capabilities, or to acquire their first systems (usually for communications, Earth observation and imagery intelligence) in order to be more responsive to social and economic development. In the commercial space sector, Euroconsult believes about 50 companies will launch almost 2,000 satellites, of which 1,700 units will be for 22 commercial constellations (of which one single constellation accounts for 70 percent). Commercial space still means communications and broadcasting satellites in geostationary orbit; these satellites represent almost 50% of the $70 billion of commercial revenues expected over the decade. The two other large commercial markets are for non-geostationary orbit satellite constellations for communications (25 percent of revenues) and Earth observation (11 percent of revenues). New commercial markets are emerging for on orbit services such as life extension and for on orbit tourism (mostly lunar). Rachel Villain, Principal Advisor at Euroconsult and editor of the report, said that the satellite sector is undergoing a massive transformation as more commercial and governmental entities take advantage of constellations to introduce new satellite services on Earth. Euroconsult anticipates that more than 40 constellations of various sizes and capabilities will launch about 2,300 satellites into low or medium Earth orbits for services as diverse as communications, navigation, Earth Oobservation, meteorology and data collection from Earth sensors.